Our local newspaper has been asking readers to share their harbingers of spring. 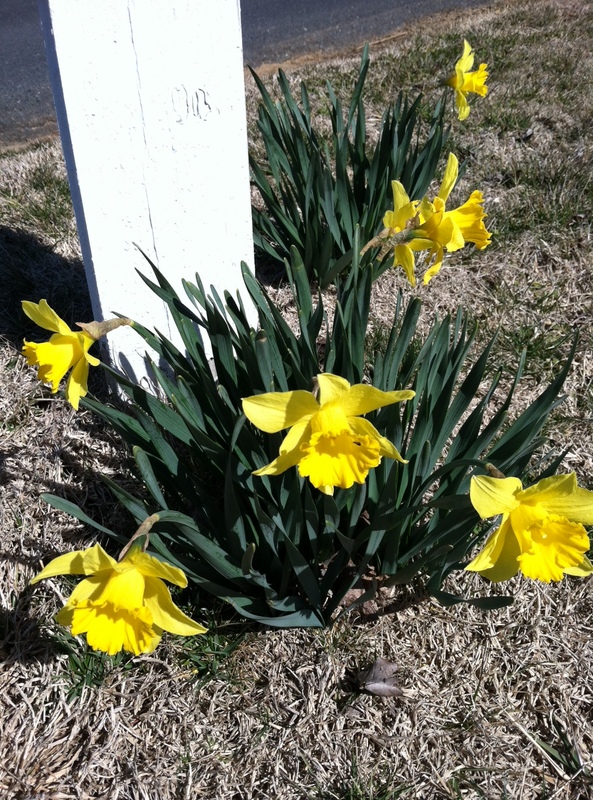 For most folks around here, seeing the daffodils blooming is the first real sign of spring. Although this winter, we’ve had a warm day or two tossed into the mix every couple of weeks so that the daffodil greens have been up for awhile. Daffodils and jonquils are cheery flowers and they manage to keep their heads up even if we have a late frost. Spring and Fall are my favorite seasons, but Spring has the edge. Since I don’t care for cold weather, I look towards March on the calendar all winter long. I study my garden area from the kitchen window, planning how I can do a better job than I did last season, working out a new plan to protect my tomatoes from the squirrels this year. I stand on the porch next to the pansies, standing in the little bit of sunny warmth that has kept them going all winter. Spring is the season of promise. The promise of more sun and fewer clouds. Warmer temperatures. New green on old brown. Yesterday, I spent the morning unloading bags of compost and manure from the back of my car and hauling them down to the garden. After pouring it all out and raking it over the bed, I got out the trusty old mattock and turned over a narrow section close to the edge. I have been itching to get something in the ground and at this time of year, lettuce is the way to go. In a week or so, I should see the sprouts cresting. I have a new mattock, but I use the old one because it belonged to my maternal grandmother. She was so talented with her hands. She grew beautiful roses, had gardens, cooked great food, created beautiful needlepoint works of art and the list goes on. Surely if I use her mattock my garden will be more successful. As I was digging in the dirt, I listened to the staccato tapping of a woodpecker. We back up to a lake so it was no surprise to see 2 mallards waddling through the yard, hoping for a cache of grass seed. Why didn’t I have my camera with me? We stopped and looked at each other for a few minutes, then went back to what we were doing. And yes, I admit, I did talk to them. No, they did not answer me. When a large group of ducks are playing or whatever else it is ducks do in the water, their quacking sounds like laughter. The sounds of Spring. However, in the midst of soaking up every possible sign of the season, I am reminded of how this can be a sad time of year. I have two friends who have a parent battling cancer. One is in the early part of this journey – and the hope for healing and recovery is strong, like flowers pushing their way through the dirt towards the sun. But the other is close to the end. And as much as you want their struggle and suffering to go away, you also want the clock to stop. You want more time and the signs of spring are a painful reminder that life goes on. One of our nieces popped in for a quick weekend visit last weekend. She brought us a bouquet of beautiful yellow tulips and that was my reminder to do one thing that really lets me know it’s springtime. Take the scarf off the Count. 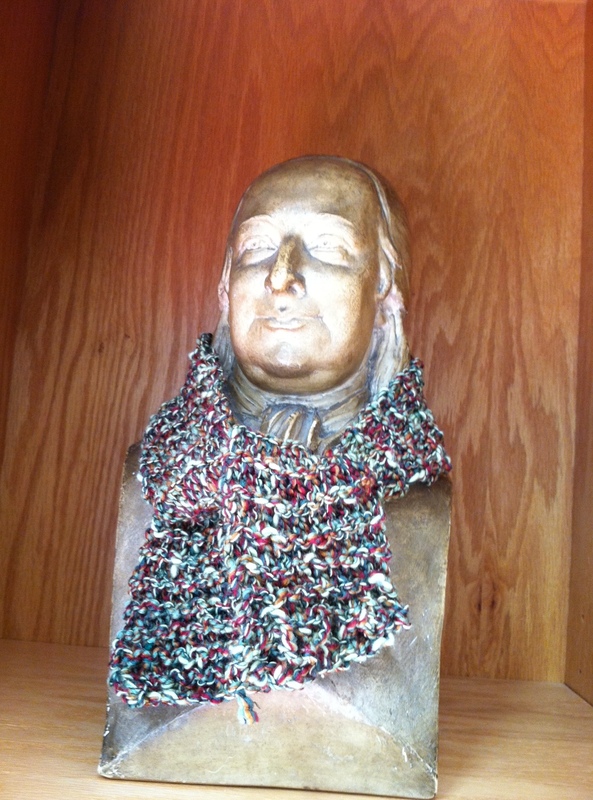 This bust is of Count Nicholas von Zinzendorf, a very distant relative. He watches over us from the shelf in the living room all year. He’s old and I know he gets cold in the winter, so a couple of years ago I knit a scarf for him. I really did it to see how long it took my family to notice. Now I put it on him every winter and then, come spring, I take it off.